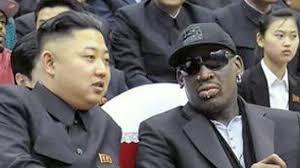 As the United States stands on the brink of nuclear war in light of escalating threats from North Korea, the most informed man on the leader of that country, Kim Jung-Un, is not our Secretary of State, John Kerry, or President Obama, but former NBA great Dennis Rodman, who goes by the sports nickname ‘The Worm.’ As a result of his visit to the country as part of shooting a documentary, and subsequent friendship with North Korea’s leader, he suggested that Obama should call North Korea’s leader and discuss basketball. He was widely scorned, but I argue he’s on to something lost in both politics and religious discourse. Dennis Rodman recently traveled to North Korea to visit Kim Jong-Un, and returned calling him his friend and suggesting that something as simple as Obama picking up the phone and talking about their common passion of basketball might be enough to chill relations between the two nations, and possibly stop nuclear war. With very few exceptions, the media ridiculed Rodman and his suggestion, laughingly dismissed with the label “basketball diplomacy.” The Obama Administration was also quick to issue a negative response to Rodman’s efforts, with White House Spokesman Jay Carney simply restating U.S. concerns about human rights violations, and noting that lines of communication are always open between the two countries. This casual dismissal not only took place by way of discussion about Rodman, but also in front of the athlete himself, such as George Stephanopoulos’ interview on ABC’s This Week. After some reflection, in my view the media, conservative and progressive politicians, the Obama Administration, and much of America’s citizenry, were far too quick to assume Rodman could not be taken seriously with an idea that could really change the course of international affairs. Rodman was right, and he has articulated a simple practice of human interaction with promising possibilities in a great number of areas of life. What was it that Rodman suggested that many found so laughable? He said that Obama should pick up the phone and call Kim Jong-Un, and talk about something that both men have in common. He’s saying, engage in personal interaction as human beings about a topic of mutual passion, and see what might happen in transforming the relations between the two countries as a result. At first consideration this may seem simplistic and naïve. But there’s good social psychology behind. The scientific and experiential data indicates that when enemies or rivals are brought together for personal encounter and conversation, over time they tend to develop more positive views of each other, and while their disagreements and tensions don’t disappear, there is a newfound ability to maintain them in peaceful and civil fashion. This is one of the elements used by the Foundation for Religious Diplomacy. In our work we bring Mormons and Evangelicals, Jews and Muslims, Christians and Pagans together, religious groups usually at odds with each other. For those who make the effort and come together, even while discussing and not ignoring areas of unresolvable disagreement, a transformation occurs in heart and mind. The parties are able to come to a new understanding of each other as friends, even while disagreeing and perhaps even finding aspects of the other’s beliefs and practices distasteful. They move beyond the traditional categories of enemies and friends, to the creation of a new social category, that of trusted rival. Some may say in response to this suggestion that it is inappropriate. A couple of years ago I was invited by FRD to be part of a small group that would speak Iran’s President Mahmoud Ahmadinejad with during his visit to the United Nations in New York. I wasn’t able to make the trip, although I wanted to, but I touched bases with a fellow Evangelical who likewise had received the same invitation, but turned it down as inappropriate. He argued that Ahmadinejad was like Hitler, and it would have been wrong to meet with such a dictator in that it would grant him undue legitimacy. The same argument is used in regards to Kim Jong-Un. He is considered a dictator, a murder, and a leader who oppresses his people. Better to keep our distance, denounce the human rights abuses, and continue to rattle our military and political sabers. But such thinking is clearly wrong-headed. I would argue that it is possible to sit down with someone like Kim Jong-Un or Ahmadinejad, and while not granting approval of their troubling actions, and in a position of strength coupled with diplomatic humility, engage such people in a face-to-face meeting. And the subject matter for such conversations need not be a continual restatement of our areas of concern and disagreement. Those should not be ignored, but they are well known, and there is a place for expanding the conversation so that a humanizing process takes place and relationships can develop. Over time such processes will result in the formation of trusted rivals, which holds far more promise than the perpetuation of confrontational engagement from afar. What is the alternative? The U.S. went to war in Korea in the 1950s with the idea of stopping the spread of Communism, and after mass death on both sides, the result was a Korea divided into South and North (Communism still firmly in place), the ongoing placement of U.S. troops in the region, and the threat of nuclear war always on the horizon. Lately the rhetoric from North Korea has ramped up, and in response, the U.S. sent F-22 stealth fighter jets and a naval destroyer with the capacity to down surface to air missiles should there be a detected launch of a possible nuclear device. Our policy for many years has been one of detached isolationism. The idea is to keep North Korea isolated, continue to exert pressure through the use of United Nations sanctions, and issue statements of denunciation over concerns from afar. Some consideration has been given lately to moving away from isolation to one of engagement, but personal forms of interaction that shift from the rhetoric of a dictator enslaving a rogue nuclear nation have yet to be considered. Indeed, in his entire first term, President Obama did not make a single effort to reach out personally to Kim Jong-Un. This administration merely perpetuates the policies of their predecessors that have been tried and found wanting. In my view for decades we have been fulfilling the pop culture definition of insanity: doing the same thing over and over and expecting different results. Perhaps it wouldn’t work. President Obama may one day pick up the phone, or get on Air Force One, and travel across the sea to sit down with North Korea’s leader. And maybe after talking about basketball, discussing their favorite NBA teams and stars, when the conversation turns to their grievances, each man remains as staunchly committed to their loggerheads as they are now. Or Kim Kong-Un may prove himself through his actions and speech in relationship and conversation to be little more than the dictator that America assumes him to be. But we won’t know if we don’t try. Relationships and conversations between rivals have a transformative effect in the area of religious conflict. I’ve seen it, and I practice it all the time. It will work in politics too, if our political leaders can find the will to resist jumping on the bandwagon of dismissal and ridicule of a simple idea simply to stave off complaints from an opposing party or bring their actions into conformity with the latest polls. Dennis Rodman is certainly outside the bounds of “normal” society. But he’s right on the personal element, on friendships and conversations. Let’s not dismiss a possibility simply because we find the messenger flamboyant, and therefore lacking in credibility. Let’s consider taking the risk of trying basketball diplomacy so that personal relationships between trusted rivals can serve us all as a tool in preventing nuclear war.